We had a fantastic three days, three nights trip in Geneva, Switzerland. The plan was to hire a car and drive to French Alps and Swiss Alps. We want to summarise our fantastic trip. We flew from London Heathrow Airport to Geneva Airport on Saturday evening. There are two sides of Geneva Airport, French and Swiss side. Our intention was to exit from Swiss side of the airport. The SUV was pre booked at the airport and ready for collection. It was easy to find the Rental area as the directions were clearly marked. We went to Hertz counter and showed our reservations. We were offered to upgrade luxury SUV for nominal extra charge but we decided not to accept the offer and stick with the one we booked. Once all paper work were sorted, we were asked to take shuttle bus to parking, which is only 4 minutes away. Our vehicle was Subaru XV Diesel. It was different from our expectation of Mazda CX 5. The person at the counter convinced us that Subaru is better option than Mazda. We got into the car and drove to our accommodation which was 5 kilometres away in the place called Troinex just outside Geneva city. A Swiss motorway or auto route vignette is required to use the national motorways. It’s a sticker you need to apply on the inside of the wind-shield of your car. If you are not taking auto routes, this is not required. Our rental car came with vignette so we did not have to worry about it. Be prepared to pay toll frequently ranging from 4CHF – 10 CHF. Headlights must be on when driving on auto routes. Chamonix was 85 km from where we stayed. It was hot sunny day but we were prepared with few jackets as we were driving to the Alps. Plan was to stop at anyplace which is beautiful to enjoy the majestic view of Alps. We stopped at service centre ‘Shell’ to get refreshments, there were not many options to eat. Services seems to be pricey. All services were primarily designed for lorries. Driving on Autoroute Blanche. You can see Vignette on windscreen too. 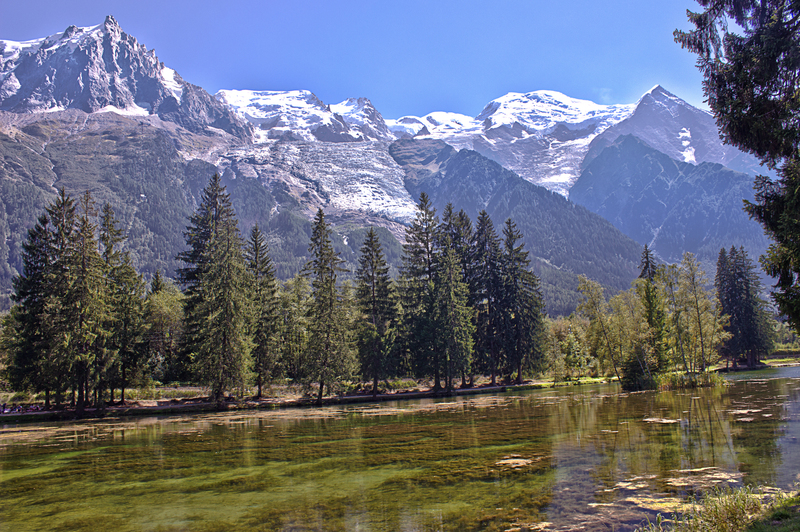 We continued driving through the Les Gaillands by the L’Arve river we saw this another beautiful stop. There was a free parking which was handy to stop there. This is where Torrent de la Creuse meets L’Arve river. We wanted to find a supermarket , there was Carrefour in close proximity, we drove on small village road uphill. Parking was not a problem at Carrefour and was apparently empty. After few seconds, we realised it was Sunday afternoon so the store was closed. 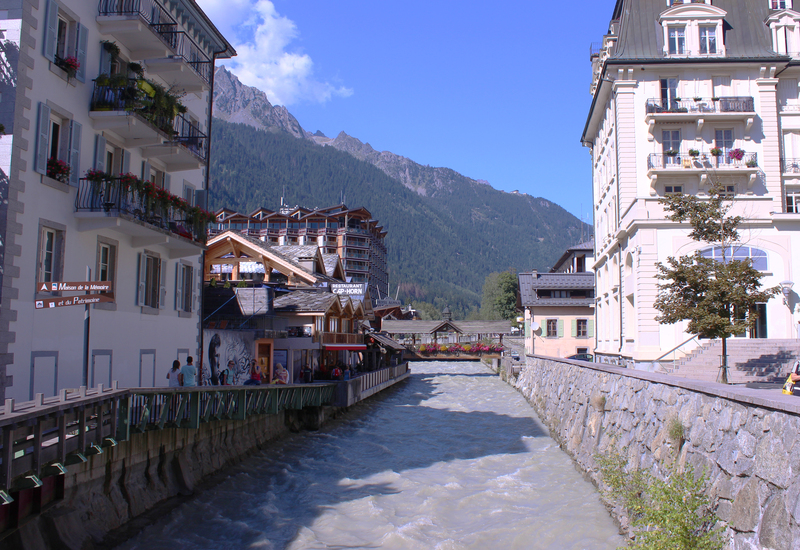 The next stop on the list was Chamonix town centre. There are several paid parking areas in town centre. Finding parking was not a problem. On a lovely Sunday afternoon town centre was buzzing with beautiful vibes. Apparently, there was Ultra-Trail du Mont-Blanc final day so town was crowded with supporters. River L’Avre flows from the right in the centre of the town centre. There are few small beautiful bridges. We found a grocery store which was open and took advantage of buying few snacks and drinks. There were loads of nice restaurant to eat. We bought souvenir from one of the many souvenir stores. 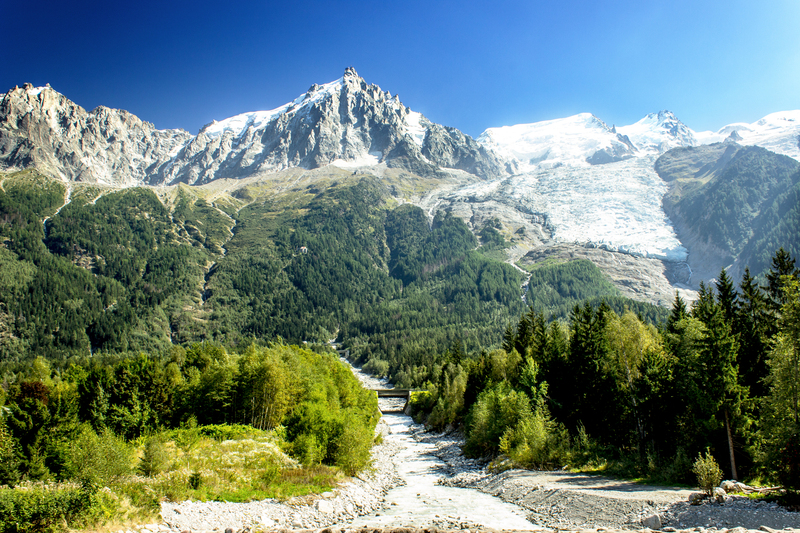 It was absolutely fantastic day to spend on the beautiful town of Chamonix. After strolling around there for some time, we called off our day and headed back to Geneva. Day II was the most exciting day for us. The plan was to start from Troinex to Montreux., take a lunch break and stroll around the city. Drive to Interlaken via Saanen. On the way back drive to Bern and then to Geneva to experience lake at night. We stopped at the first scenic stop of the day. On the way to Montreux we got bird-eye view of the lake with mountains on the background. Parking was easy to find and was not expensive either. We parked by the lake. There were many artistic objects like sculpture, paintings, photos were on display by the lake. Particularly we like the one with human shapes below. Lake Geneva water was so clear, all pebbles were clearly visible, The greenish water-colour enhanced the beauty of the lake. There was a huge shopping centre and few places to eat by the lake. We went to one of them and got take away for a lunch to eat by the lake. We bought snacks to have it later on the way to Interlaken. 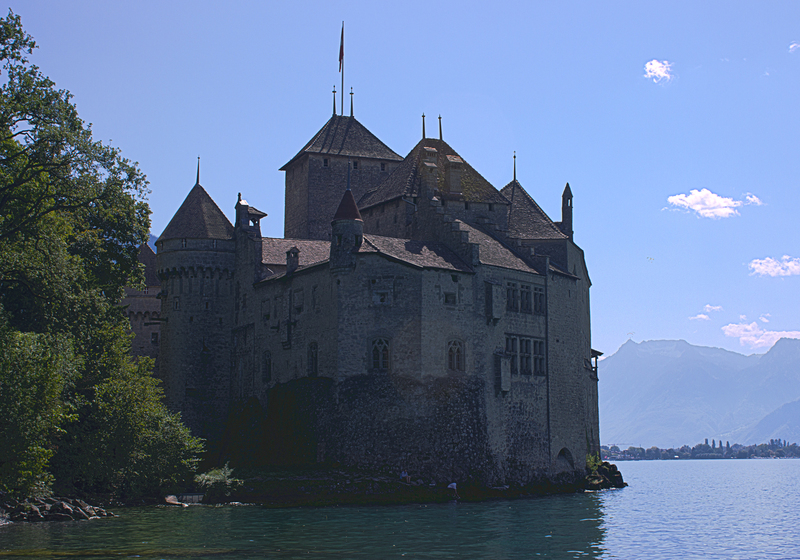 Château de Chillon is approximately 3 km from Montreux. It was worth visiting picturesque and most visited castle in Switzerland. Our rental car came up with a blue parking badge so we got free parking nearby castle. One side of the castle was under refurbishment which was disappointing however I manage to get photograph from the other side. I also discovered a little pool surrounded by rocks with an opening to the lake. It was an ideal place to swim for a hot day like that. Ultimate plan was to go to Interlaken, we had two choices to achieve it. 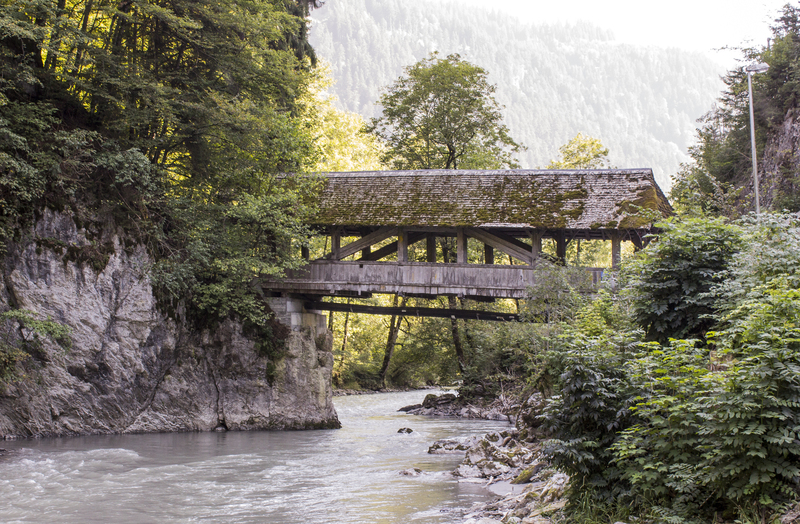 One was to follow direction on our Tom Tom and take auto route to Interlaken or take country road via Saanen to interlaken, We decided to take country road for an adventure. After driving about 15 kilometres from Montreux, we started climbing to the mountains from where real fun began. The road was steep with loads of bends and there was just about enough space for two vehicles. Twist and turns were so frequent I had to be in high alert to drive. We pass through mountains, valleys, towns, farms, it was amazingly beautiful. This was the real image of Switzerland we had in our mind. We stopped over in few places where we can get close to the nature. It was a long and slow drive but we were enjoying every seconds of it. Frequent ambient sound from cow bells simply add the vibrance to the nature. See some of the clips below. We saw small stop by with a cafe by the river, in between mountains. It was so beautiful. We could not resist not to stop there. There was a wooden bridge to cross over to other side. We sat there eating snacks listening to the sounds of the river and wind. We drove by the lake Thunersee to reach interlaken. We parked behind casino Kursaal. 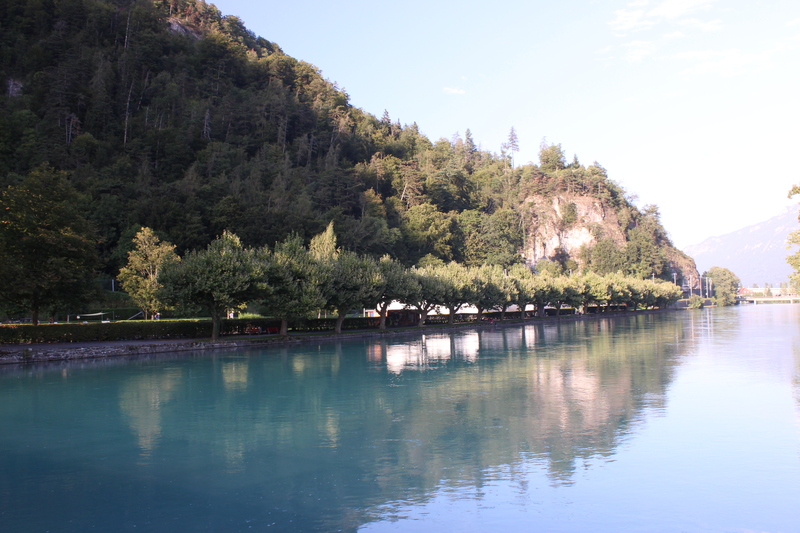 We spent some time on the beautiful Aare river which flows between Lake Thun and Lake Brienz. 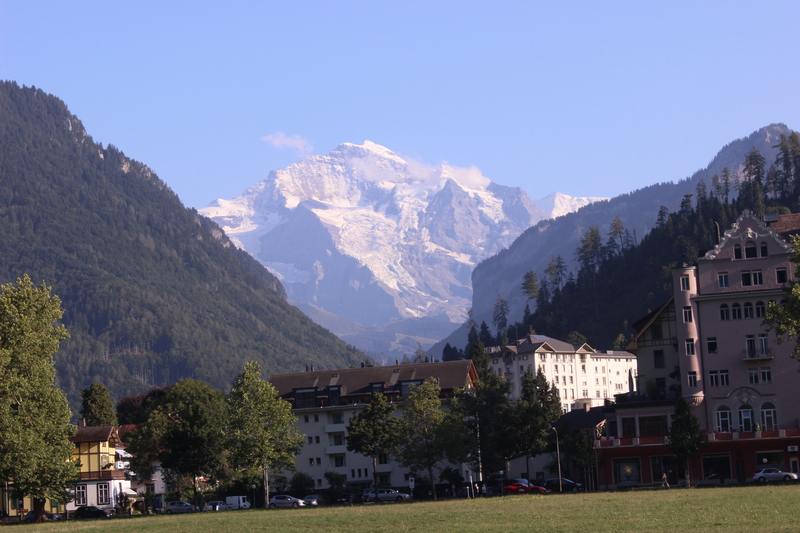 We walked to the town and our first impression was, Interlaken is stylishly luxurious as we saw expensive cars, Casinos, Victoria Jungfrau hotel and many branded stores. As we walked further it was not just posh town, things were getting to normal standard. We enjoyed majestic view of snowy mountain from the centre. We bought Swiss souvenirs, not surprisingly cows, from the centre. It was a small beautiful town. 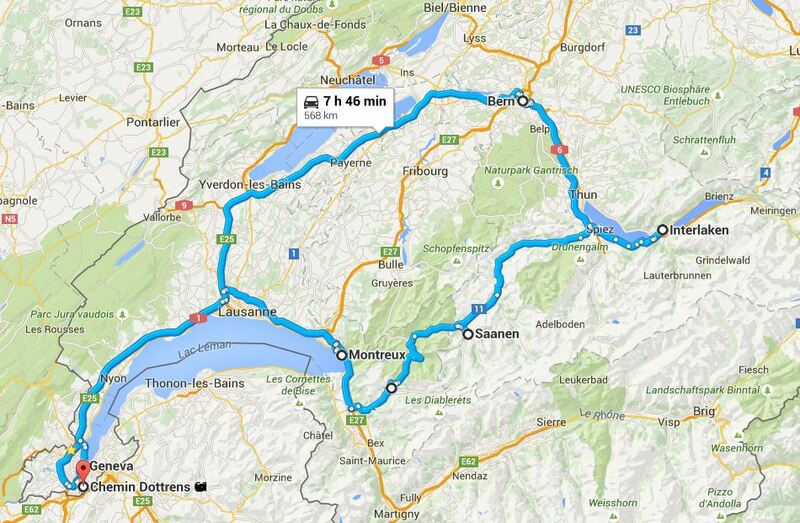 We drove on auto route to Bern, we do not remember paying tolls anywhere in compare to Chamonix trip. We assumed tolls are common only in French autoroutes. Finding parking was tricky, eventually we found one. We walked around the city for sometime. It was about 7 PM in the evening. There was a strange combination of ambience and serenity. It was eerily quiet in the city. In a way it was nice but was a bit scary too. We walked to Kirchenfeldbrücke bridge, 229m first iron high level bridge and witness the beautiful view of Bern. City seems to be very relaxed, we saw people playing football, roller blades in the park. The most interesting thing was the water of river Aare was so clear, we saw the bottom of the river from the bridge. There were many groups, couples who were swimming on the river, it felt like seeing mermaids from above the bridge. Everything seemed to be really pleasant in Bern. 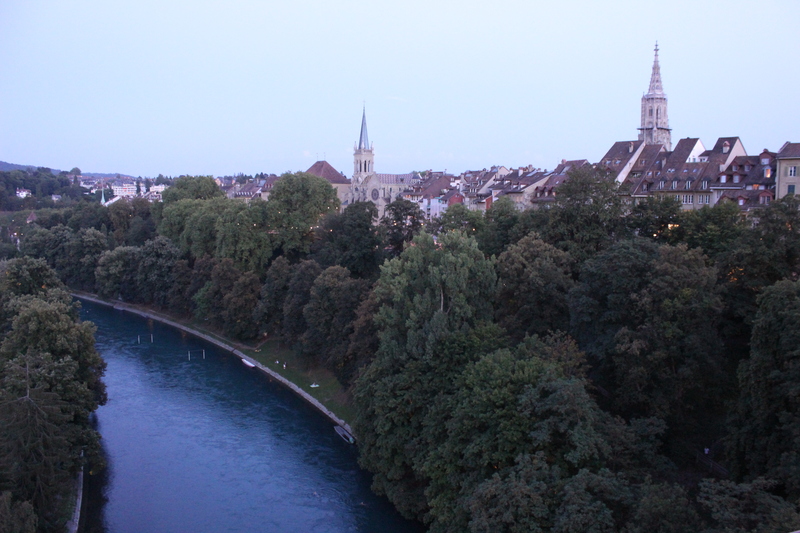 We talked about the calmness of Bern for a long time whilst driving back to Geneva. The final stop for the day was Geneva. We drove and park at Jet-d-eau-fountain. It was about 11:30 PM when we got there. The jet was not in operation, later we found they turn it off at 11:00 PM in September. Nevertheless, we did not regret, there were so many other things to enjoy. Next day was my birthday so Simi had a plan to do mini celebration.We sat there celebrated my birthday with my favourite cake ‘tiramisu’. It was beautiful see around due to the lights from the opposite side of the buildings and the reflections on the water. We planned to do things slowly. We enjoyed late breakfast listening to music taking about the beautiful experiences we had a day before. We pack up our bags and checked out from our accommodation. The day was cloudy. Our plan was to visit places in Geneva city. We went to Jet d’Eau. We parked car in the basement on negative fifth floor. We nearly got motion sickness revolving our car in circle to find a parking space. Jet d’Eau was in operation as anticipated. It was pouring down when we got there. There were few cafe to sit and enjoy so we did. We spent a long time chatting and laughing. When rain stopped we went to the centre, did some shopping, bought chocolates. We stroll in the city for sometime and headed to Geneva Airport to start our another journey to Budapest. Thank you, Cindy. It was definitely one of the best travel experience.